It would be more accurate to call this post [1928/9] The Broadway Melody of 1929, seeing as within a dozen years we also got The Broadway Melod(ies) of 1936, 1938 and 1940 and just narrowly missed out on 1942 and 1944. It is unfair to compare successes and downfalls of early film to its modern counterparts. It’s also quite unfair to have a negative opinion about The (first) Broadway Melody, because, for all its hokeyness and humdrum acting and plot points, without it we don’t necessarily have some of the luxury that allows some modern film room to sing, dance and talk. If only at the 2nd Academy Awards do we get our first taste of ‘talkie,’ it’s fitting that the Academy should bestow upon it film’s highest honor, but how we looked at film has changed as dramatically as what the film is about. As recently as 2013, The Academy has honored film more for filmmaking (Gravity) than for storytelling. Some things change – the public’s tastes, technology, budget, morality – but others don’t. As we approach the 86th awards next March, we’ll expand the list of nominees to a balmy 521. Of the 85 winners so far, 83 have been talkies all but 1927/8’s Wings and 2011’s The Artist (save a single line of dialogue). We don’t take talking film for granted because we can probably count on a few dozen hands how many people remember when film without talking tracks was commonplace. 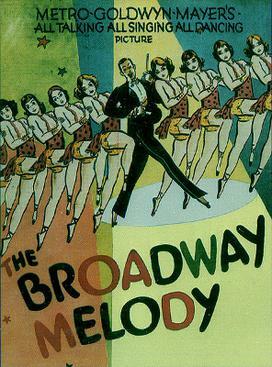 We do, however, pay our respects to the early film for taking risks – some successful, some not – and exploring techniques that worked for several installments of The Broadway Melody, including, but not limited to, vocal tracking, the musical and sequels. So while we’ll get bored and tired of the Mahoney sisters’ tired acting and the poor film tracking and playback, we’ll remember that the majority of the people who saw and voted for The Broadway Melody in 1929 had never seen anything like this before. Technology and budget had limited options to either audio or video – but never both. The audience probably – and all conjecture – did not care about ‘forward’ thinking technique as we do now as so much of the tech canvas had still yet to have been filled with single-cut shots, CGI and lens flare. For the audience, who’d have a median age of about 150 now, the fact that the actors talked was enough. Without much history from which to draw, The Academy awarded simplicity and technology equally in 1929, story almost notwithstanding. The film is important as an early example of movie musical, upon which Hollywood continued to draw inspiration, including 4-6 basic remakes of the same archetype under the same title as a response to supposed demand. Hollywood and independent filmmakers alike have drawn on the presence of music – specifically song and dance – to draw in crowds for decades, most recently in 2012, when Les Misérables almost (didn’t) win Best Picture. The most attractive takeaway from The Broadway Melody, any of them, really, is a concentrated purpose in production. Metro-Goldwyn-Mayer’s risk paid off in dividends and continues to reap benefits for producers and delighted viewers. As for plotting, the main function of The Broadway Melody‘s most ludicrous plot is to drive the song-and-dance home to cultural significance. Again, it’s tough to measure intent with no living firsthand sources and it’s unfair to continuously compare apples and oranges, but it’s almost certain the only lasting memory of this film in modern canon is Edward M. Cohan’s enduring hit, “Give My Regards To Broadway,” tastefully embedded under the title credits. Forgettable is the boring love triangle and the villainy so vehemently and obviously forced. One neither likes nor dislikes this film or its sequels. Its place in Academy canon stands next to the other 1928/9 films in that each had something disparate to offer. If you’ve not seen this film, it’s worth a look, at least inasmuch as any other of the nominees from 1928/9, The Patriot (not the one with Mel Gibson), Alibi (not the one with Jennifer Garner), Hollywood Revue (not the same film as The Broadway Melody) or In Old Arizona (not starring a young John McCain). It’s also a truck pick ’em as to whether you’ll like this or not, but go into it with an open mind. The worst outcome is that you can’t get your 100 minutes back – but you’ll save hundreds more on its sequels. You’ll hear from me again when I review The Broadway Melody of 1935, but until then keep an open mind!